Hyperhidrosis is the clinical term for excess sweating and affects up to 1% of the population. 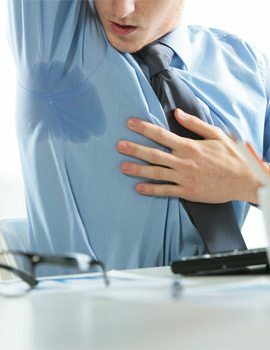 We are able provide you with a treatment for excessive sweating which can be a very embarrassing condition. Hyperhidrosis is the clinical term for excess sweating and affects up to 1% of the population. After having tried many different solutions for excess sweating suffers are left wondering where to turn to solve their hyperhidrosis. If you are fed up of not being able to wear what you want, and worrying about embarrassing sweat patches, perhaps our excess sweat treatment is the answer you have been waiting for. Our excess sweat treatment is very quick and very effective. The treatment takes about 30 minutes to perform and lasts for between 4 and 8 months. First you will meet your injector after booking in for a free consultation. They will explain the pros and cons and together you will decide if the treatment is right for you. The skin under the arms needs to be cleaned to reduce the risk of infection. After this is done, the doctor will mark out the areas for injection. There are typically 10 injections under each arm of 6 units in each injection site or 15u of dysport in each injection site. Treatment takes about 5 minutes and is not as painful on the face. After treatment there are a few things you can’t do. You can’t go to the gym or do yoga for 24 hours. Alcohol and massage are also to be avoided. As a lot of product is used for treating underarm sweating, the price is slightly higher than in other areas. Treatment typically costs €699. Let us know if you find better than that as we have seen up to €1,000 for treatment in some clinics.